Sometimes YouTube has just the right idea. Here is the New El Dorado Jazz Band, performing at the Seaside, Oregon Jazz Festival during February 22-24, 2012 — that’s Hal Smith, washboard; Katie Cavera, banjo / guitar; Dave Brown, string bass; Carl Sonny Leyland, piano; Mike Baird, clarinet; Howard Miyata, trombone; Marc Caparone, trumpet. Back to YouTube. Without meaning to do so, they have cut through the ideological chatter that continues to afflict jazz. Is this New Orleans jazz, Dixieland, traditional jazz, small-band swing . . . what-cha-call-em-blues? No, without knowing it, they have taken their cue from Eddie Condon and his brother-in-law Sidney Smith, who chose to call what Eddie and friends played simply MUSIC. And that it is! More to come from Seaside and the New El Dorados, courtesy of the fine band and of our steady videographer “islandstarfish“. The questions make me sad. Sometimes it seems as if listeners are made nervous by the music’s potential to surprise, as if jazz had become a little dog, very sweet-natured, that could turn around and bite badly. Uncertainty makes us tremble, but I didn’t think that the need for certainties would have so infected our ability to love the music on its own terms. Some people with good hearts and ears will only be truly easy and happy when they know that a performance of ATLANTA BLUES is “down-home,” “Mainstream,” “pre-bop,” “trad,” “neo-retro,” and the like. Pick your terminology. It reminds me of those charts in INTRODUCTION TO JAZZ books with everyone neatly listed, either in tables or in timelines, from Buddy Bolden (he was “New Orleans,” we knew) to Charlie Parker (safe at home in “be-bop”). Roy Eldridge gave birth to Dizzy Gillespie, and so on. I always found those charts annoying because of their conservative narrowness: were Ben Webster and Lester Young “Swing” players who weren’t allowed to go out of their front yards? And the charts left so many people out: I never saw Joe Thomas anywhere. Although I am an “academic” by profession (I have taught English to college freshmen and sophomores for longer than Bix Beiderbecke’s time on earth) I blame the academics even before there were Jazz History courses, in their attempts to standardize, categorize an organic art form into something teachable — with final exam questions to be determined later. Charts and boxes, timelines and categories are attempts to quantify something that threatens to spill out and over the edges. These restrictive mechanisms have governed literary anthologies (organized by “schools” and arranged by the birthdates of the writers being studied) for many generations. It’s a tribute to any art — jazz, poetry, painting — that such well-meaning acts haven’t killed it dead. Then, of course, jazz is a music that blessedly stirs up fierce allegiances. That’s a good thing! I love to see people who hug their music to their hearts: both they and the music are fully alive in such moments. But allegiance devolves into party skirmishes and ideological statements: my music is PURE; yours is COMMERCIAL. Mine is THE TRUTH; yours is CORRUPTED. The journalists and critics saw good copy here and thus we had DIXIELAND versus BE-BOP and the like, the ancient doing battle with the new. The musicians knew better and respected each other: Baby Dodds and Max Roach weren’t at war. But the need to name, to classify, to take big living entities and force them into little boxes — a chilling process — hasn’t gone away. Too bad. It gets in the way of our ability to sink deeply into the collective creativity that jazz offers us if we’re wondering what to call what we’re hearing. Let us be guided by Eddie Condon: WE CALLED IT MUSIC. If there was a lake and a canoe it was simple. “Don’t you know it’s dangerous to go out in a canoe alone?” “But I’m not going out in a canoe alone,” she would answer. “But I am,” was the clincher. She went along to save me. Having taken the opportunity to celebrate the 105th birthday of one Eddie Condon, I remain convinced that he did much more than play rhythm guitar and talk to the customers at a variety of saloons in New York City. Although some I’ve spoken to seem to find the topic of racial integration no longer interesting, Condon has never gotten the credit he deserves as a pioneer. His achievement was more than shepherding Fats Waller to the Victor studios so that he could make two sides with a mixed band in 1929. It was larger than quietly playing his banjo alongside Louis Armstrong and the Luis Russell band in that same year. It can’t be overemphasized that Eddie was one of the earliest figures to make sure that black and white musicians could stand on an equal footing, playing their music for posterity. It was one thing to have a mixed jam session at 4 AM in Harlem; it was quite another thing for records featuring mixed-race bands to be made, to be known as such, to be recognized as classics. Much attention has been paid (rightly so) to the roles of Benny Goodman and John Hammond in encouraging mixed ensembles in public. But that was 1936: Condon’s efforts had been going on for seven or more years. If you could get listeners accustomed to hearing mixed bands on record, then they would be more eager to see their favorite artists perform in public. Condon had the first mixed band on Fifty-Second Street; his mixed troupe of jazz artists was closed out of a Washington, D.C., concert hall because of protests from the DAR. He was genuinely color-blind when it came to music, and that equality of thought and feeling had an impact. 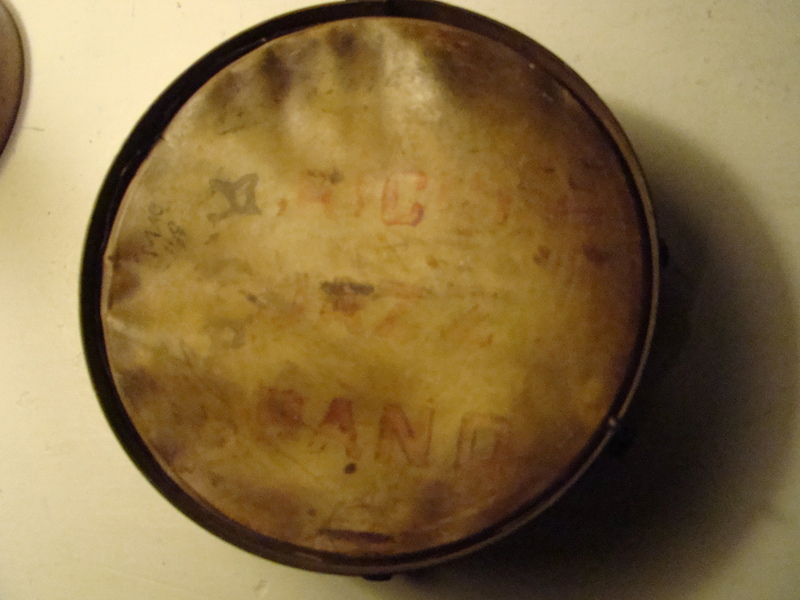 When white and black troops were serving in the legally sagregated armed forces, both sets of soldiers could hear color-blind music coming from V-Discs and AFRS transcriptions. I think of Charles L. Black, a young Southern lawyer who found himself shaken out of his racist assumptions by hearing Louis Armstrong in 1931: Black went on to write the legal brief for Linda Brown in Brown vs. the Board of Education, the decision that made such segregation illegal in the United States. I believe that soldiers who thought that “Negroes” were inferior had their beliefs changed, however subtly, by hearing Hot Lips Page and Pee Wee Russell play thousands of miles away at a Condon concert. Consider someone with similar inbred views, ten years later, seeing Ralph Sutton, Walter Page, Edmond Hall, and George Wettling play at Eddie’s club, noting that these four men got along especially well, no one was superior or inferior to anyone else on the stand. 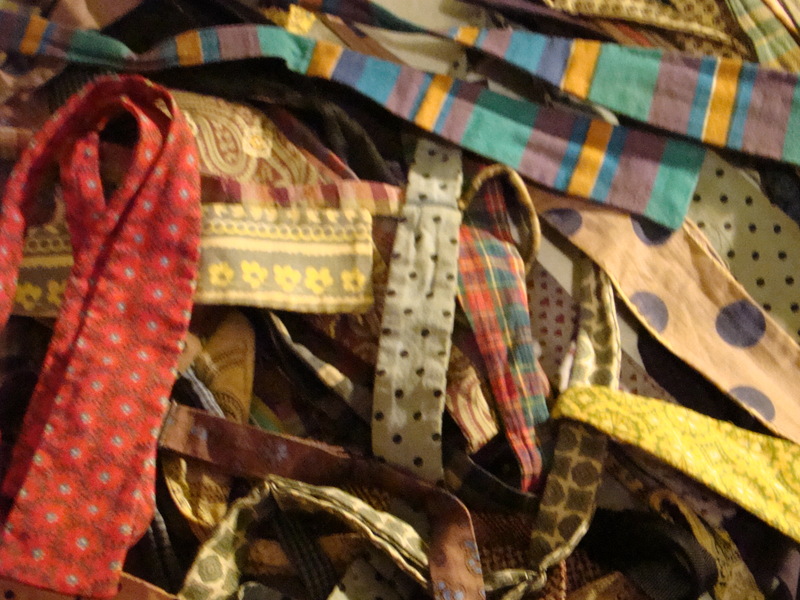 Eddie Condon made such things possible. It’s a cliche of the theatre that you can make people think about larger issues if you make them laugh in the process or if you set the ideas to music: Eddie did both, in person and as part of many ensembles. He also improved every band he was a part of: Joe Bushkin insisted on acknowledging Condon’s phenomenal harmonic sense and knowledge of songs (and, in fact, Eddie helped Bushkin through his early shaky beginnings on Fifty-Second Street by calling out the chords to songs Bushkin only half-knew). Eddie also had a fine dramatic or structural sense — listen closely to any recorded performance, in the studio or in concert. Riffs, backgrounds, knowing when to encourage one player to go on or to subtly say to another, “You’ve had your say,” all of this was second nature to Eddie — a great orchestrator who didn’t work from a printed score. How anyone ends up to be what they are as an adult may be mysterious, but Condon’s growth and development seem particularly remarkable. His birthplace, Goodland, Indiana, was not exactly the cradle of jazz. He came from a large family; his father was somewhere between a saloon-keeper and the man who greeted people in the saloon, sat down and chatted with them. It would have been very easy for Eddie to become nothing more serious than a young man who played the banjo now and again while someone else sang pop hits of the day, or while someone else played the C-melody saxophone. But something hit the young man from Goodland with the force of religious revelation. I don’t know quite how it appeared to him: was it a record by the Original Dixieland Jazz Band, or one by the New Orleans Rhythm Kings? Was it the proximity to Chicago? Jazz music — and playing that music — must have seemed the most thrilling things possible. However it grew, the transformation from Indiana boy to Chicago jazzman was quick, and it gave shape to Eddie’s life, and thus gave pleasure to so many. Eddie Condon’s club on West Third Street no longer exists: it is now part of the New York University conglomeration of buildings. Nick’s on West Tenth Street is now a gourmet supermarket. So the Condon landscape has shifted and been obliterated. But one shrine remains: the New York apartment still inhabited by his daughter Maggie, her husband Peter, their son Michael. I paid them a return visit (with my camera) and have some new delights to share — holy artifacts, as far as I’m concerned. 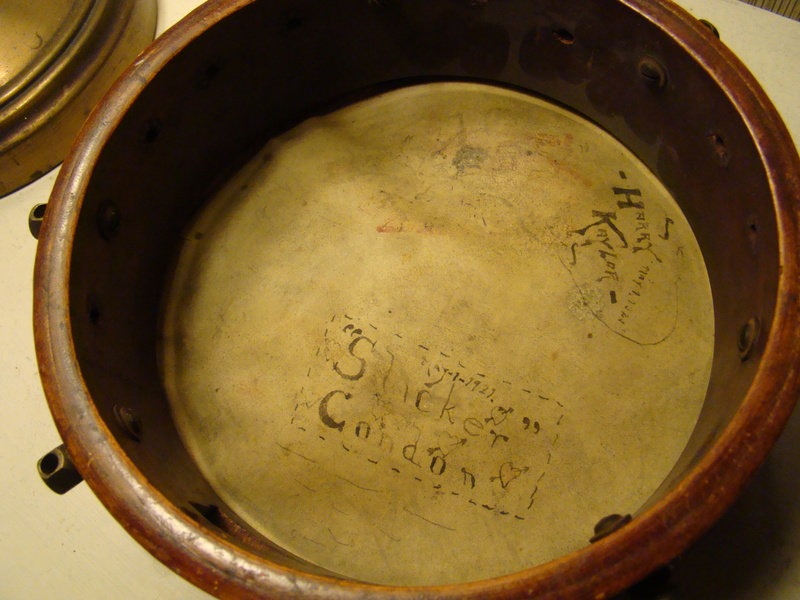 Although many of Eddie’s effects “went away” after hie death (Maggie thought that Phyllis Condon had simply given away many things to Eddie’s relatives), she still has “Slicker” Condon’s first banjo, circa 1924. It no longer has its neck or strings, but what remains is delicate and precious (even if a few of these photographs unintentionally intensify its resemblance to a nicely browned souffle). 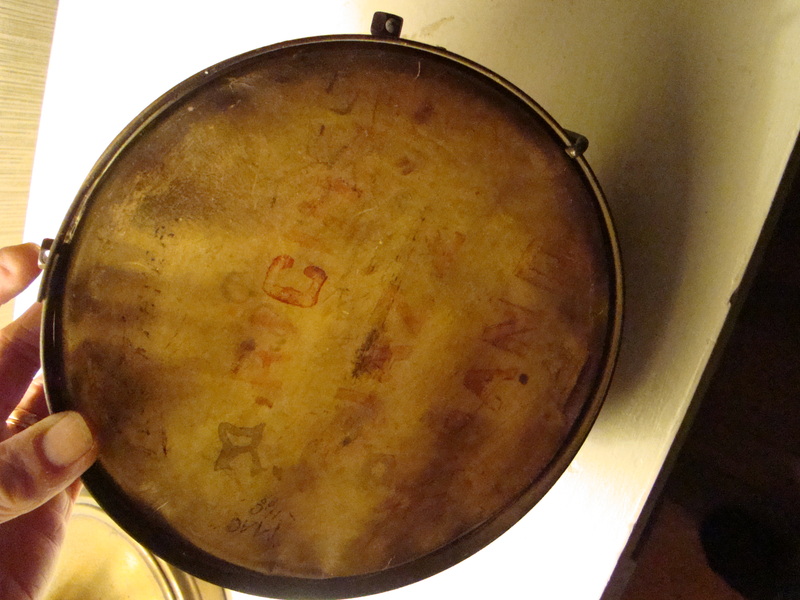 The stenciled lettering on the front reads _ _ _ _ _ JAZZ BAND, but the top line is somewhat difficult to decipher. An alternate take . 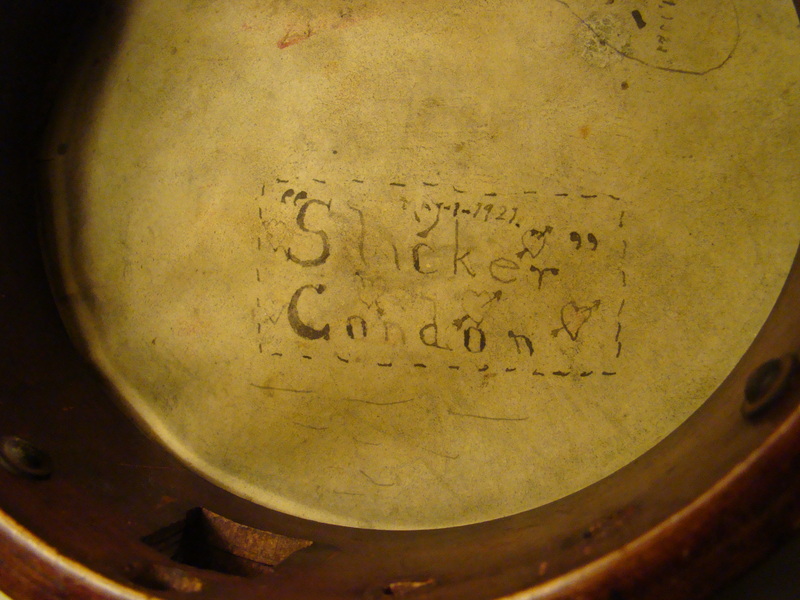 . .
“Slicker” Condon! I don’t know if that is Eddie’s Twenties handwriting or not . . .
Another view . . .
And one more. 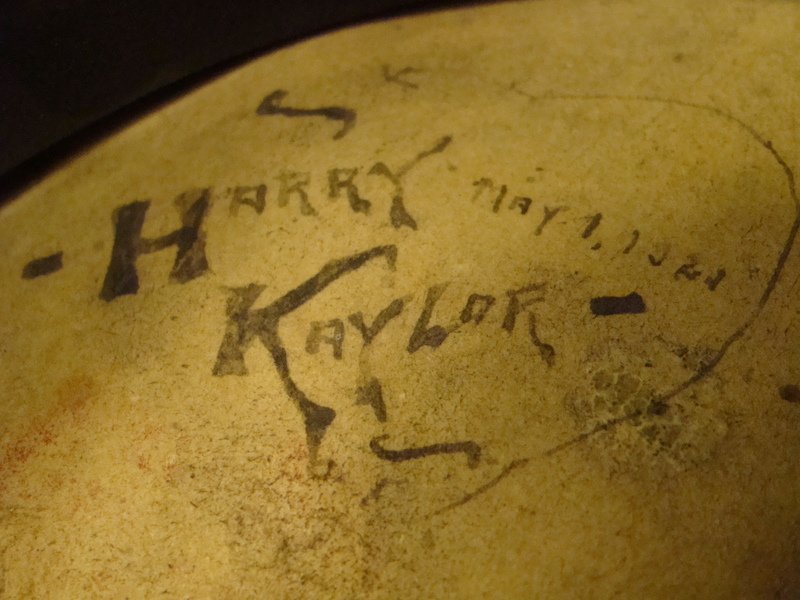 That looks like May 1, 1924, but rry Kaylor is elusive, although I don’t have my copy of WE CALLED IT MUSIC nearby. And one more series of photographic studies. 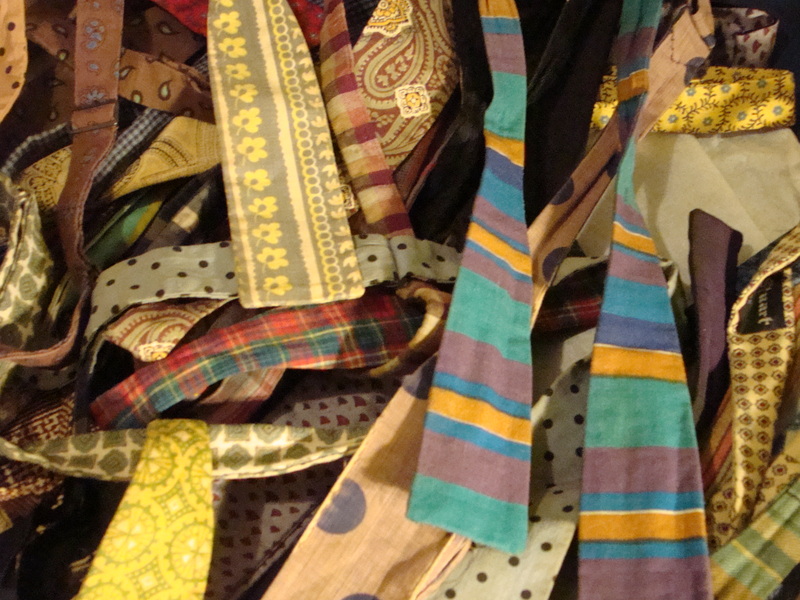 Consider this: Collage, anyone? Not an exhibit at MOMA (not yet). 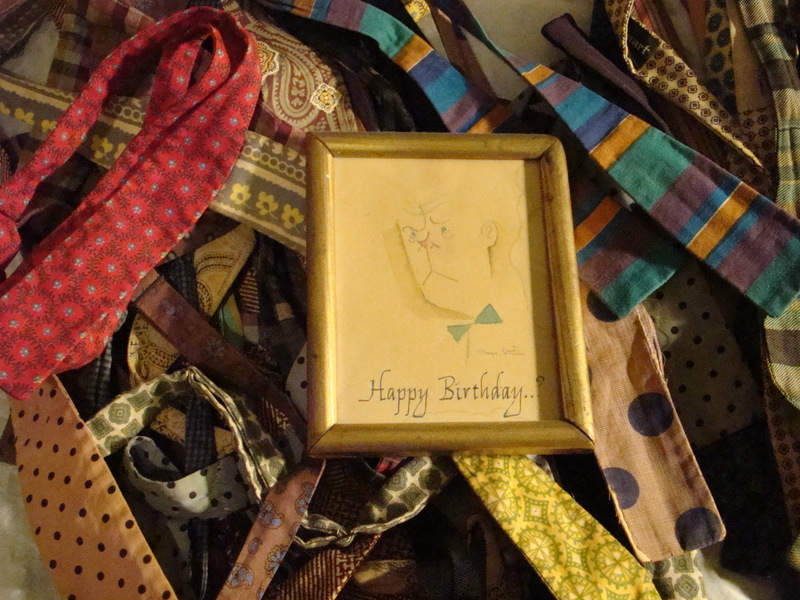 One of Eddie’s trademarks was his hand-tied bowties, and here’s a whole stash of them (with a birthday drawing done by brother-in-law Paul Smith as ornament). More to come! But for the moment, listen closely to one Eddie Condon recording and celebrate the man who made it possible. And, in doing so, slowly changed the world. Last night I went to another of Kevin Dorn’s late-Friday evening gigs at The Garage (Seventh Avenue South). The band, “The Big 72,” plays from 10:30 to 2:30. Staying for all four sets would require a preparatory nap, something I’ve never managed to do — but I was so delighted with the music that I stayed for two sets rather than my customary one. You’ll see why. Like his hero Eddie Condon, Kevin likes to employ his friends for gigs (you’d be surprised at the rancor floating around the bandstand on some gigs — not Kevin’s) and he had a particularly congenial crew of individualists last night. For lyricism, there’s the always-surprising Charlie Caranicas on cornet, who has a singing tone and many nimble approaches, not just one. The clarinet master (and occasional singer) Pete Martinez was in splendid form, murmuring in his lower register or letting himself go with whoops and Ed Hall-shrieks. I’d heard Adrian Cunningham only on clarinet before (at The Ear Inn and Sweet Rhythm): it was a revelation to hear him on alto, where he showed raucous rhythm-and-blues tendencies, bending notes in the manner of Pete Brown. 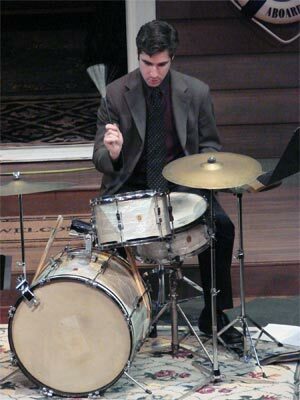 In the background, Michael Bank took tidy, swinging solos and offered just the right chords behind soloists. He deserves a better piano, but he added so much. Kelly Friesen, hero of a thousand bands, pushed the beat but never raced the time, and his woody sound cut through the Garage’s constant aural ruckus. And Kevin — well, he was in his element, letting the music take its own path without getting in its way by “leading.” His solos were delicious sound-structures, full of variety and propulsion, but I found myself listening even more to his accompaniments: the sound of a stick on a half-closed hi-hat cymbal, the steady heartbeat of his bass drum, the tap of his stick on the hi-hat stem. Here are ten performances I recorded. At first the Garage’s patrons were unusually chatty and ambulatory (or should I say Talky and Walky?) but many of them noticed that me and my video camera. Surprisingly, they executed sweet arabesques of ducking down and getting small so they wouldn’t walk in front of my lens. Thank you! The Big 72 calls what they play music. Or what would you suggest? In the spirit of the previous post, where I paradoxically urged my readers to stop reading, to abandon their screens to go hear some live jazz, I have a Real Gig to be enthusiastic about. That thinking drummer Kevin Dorn will be leading his Traditional Jazz Collective — the title alone should tell you that it is both serious and playful — for a one-hour set at Banjo Jim’s (that’s Avenue C and Ninth Street), 8:30 – 9:30 PM on Monday, November 10. The TJC will include some of the finest players I know: trumpeter Charlie Caranicas, trombonist and soulful singer J. Walter Hawkes, pianist-singer Jesse Gelber, and other friends. We used to be lucky enough to hear versions of this band on Monday nights at the vanished Cajun, so this is a treat. And, as a happy postscript, the Cangelosi Cards — featuring the slow-burning Jake Sanders and Tamar Korn — will follow the TJC. For some of us, the next day (Veterans’ Day) is a holiday, so this is reason to celebrate. “We called it music,” said Eddie Condon, “Guess that’s good enough.” For me, it certainly is.